People will soon have the opportunity to explore the Port Tobacco River virtually thanks to a panoramic mapping project organized by the Port Tobacco River Conservancy and the Charles County Department of Recreation, Parks and Tourism. Terrain360, a Richmond-based company that uses panoramic photography to map the country’s waterways and hiking trails using techniques similar to those in Google Street View, photographed the river from its many inlets and channels to where it joins the Potomac south of Chapel Point. Visitors to Terrain360’s site will be able to move forward and backward on paths along the shoreline and channels, as well as swivel and zoom in to look at details such as birds’ nests and other features. Ryan Abrahamsen, president of Terrain360, said that the Port Tobacco River Conservancy contacted him about mapping the river as an aid to conservation efforts along one of the county’s most scenic waterways. “It was perfect timing,” Abrahamsen said. “When I photographed the Potomac, I wasn’t able to cover Port Tobacco.” Two years ago, Terrain360 completed a mapping survey of the Potomac and many of its major tributaries from Washington, D.C., to the Chesapeake Bay, a project that resulted in over 450,000 photos being taken over the course of several weeks. The project was sponsored by the Chesapeake Conservancy. During that project, Abrahamsen took a side trip to map the shipwrecks in Mallows Bay as a standalone project. Abrahamsen said that he believes the Port Tobacco River project, by comparison, would require 10 hours and generate around 10,000 high-resolution images that he will then stitch together into a trail map that can be viewed from a web browser. Terrain360 employs pontoon boats with specially designed camera rigs that hold six DSLR cameras arranged in a circle 10 feet above the water to capture panoramic photos every 20 to 50 feet, depending on the speed of the boat and other factors. Custom software designed by Abrahamsen and colleagues allows the boat operator to control the camera settings automatically and see a live “feed” of the images as they are taken. The project is a labor of love, Abrahamsen said, and an opportunity to combine his twin passions for technology and the outdoors. “For the three months of the year when I can’t be out on the water, I do web development and programming,” Abrahamsen said. “The rest of the year, I’m out here doing what I love.” In 2012, Abrahamsen recalled, he was poking around Google Street View and began toying with the idea of doing something similar for the outdoors. He and two friends began experimenting with GoPros but soon moved on to more sophisticated DSLRs installed in a rig of his own design. Improvements in hardware, software and methods along the way have allowed Abrahamsen and his team to significantly speed up the process. 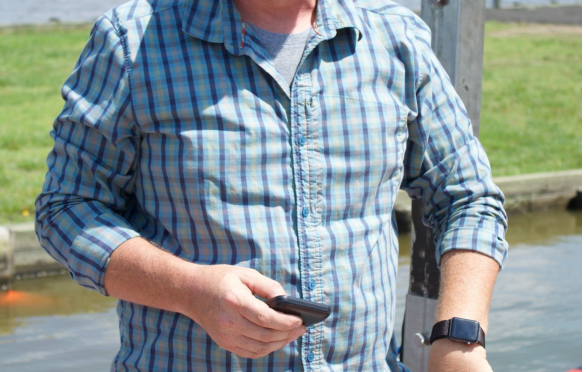 When he undertook his first big mapping project in 2014, it took five months to map the 340-mileTour the Port Tobacco River from your phone | Local News | somdn… http://www.somdnews.com/independent/news/local/tour-the-port-to… 2 of 4 6/4/18, 9:04 AM long James River in Virginia. When he returns to the James next year to document changes since then, he expects the entire trip will take just two and a half weeks. The Port Tobacco River Conservancy, which was established in 2001 to protect the Port Tobacco River watershed from sewage contamination, works with government agencies, businesses and residents to protect the river by hosting cleanups, sponsoring environmental studies and holding public education and outreach events. The conservancy reached out to the county’s parks department, which provided funds from the park’s operations budget that allowed the conservancy to hire Terrain360 to map the river over a two-day period. “It’s a really cool concept,” said John Snow, the county’s chief of parks and grounds. “This is really exciting for the Port Tobacco River Valley, the region, and the rest of Charles County.” Snow said that the mapping project ties in nicely with the county’s vision for the area. The county recently opened a new park and natural resource area along the Port Tobacco River, is expanding the interpretive opportunities at the historic Port Tobacco Village and is preparing to enter into a 30- year agreement with the Maryland Park Service to operate the Chapel Point State Park. The Port Tobacco Marina is teaming up with a local kayak club to install a kayak launch at the marina. “The main feature that ties all these parts together is the Port Tobacco River,” Snow said. While photographing the Port Tobacco River, Abrahamsen also scouted out the possibility of installing a non-intrusive “Eagle Cam” to provide a live feed of a bald eagle nest in the Port Tobacco River Park. Snow said the parks department is also discussing the possibility of having Terrain360 map the county’s 30-plus miles of hiking trails. Tour the Port Tobacco River from your phone | Local News | somdn… http://www.somdnews.com/independent/news/local/tour-the-port-to… 3 of 4 6/4/18, 9:04 AM Terrain360 has designed a backpack-mounted camera rig that it uses to produce tours of hiking trails such as the Appalachian Trail. Google has since developed its own version of Abrahamsen’s system, called Google Street View Trekker, which provides backpack camera rigs to people via a loan program. Abrahamsen said that he regularly wears out the cameras’ shutters from the heavy use. “I literally have like 30 cameras sitting there on my workbench, ready to go,” Abrahamsen said. The immersive trail map of the Port Tobacco River will be available on the Terrain360 website at www.terrain360.com in a few weeks. Snow said that it may also be made available through the Charles County Government website at www.charlescountymd.gov.